Just as not all persons without disabilities will be comfortable in a college environment, some children and adults with disabilities are not able to sit in a classroom or participate in a sheltered workshop. Some will need specially devised activities. Instead of complaining about how much is spent by school districts maybe it is time school districts and governmental agencies look at less expensive ways that things could be done to meet the person's needs without having to send them out of state or into ill fitting program. This post is not intended to present what we do as appropriate for your child whatever his or her functioning level. Rather it is intended to give you a glimpse into the thinking process we use to adapt to Billy Ray's needs. He is out of school. When he was in school the Director of Special Education and I worked together to provide skills training and customize a program to Billy Ray's needs. This meant some community activities as well as at the School District Office. It seems important to note that we did that after the school our district was sending Billy Ray to decided that they could not accommodate the structure that Billy Ray would need. Interestingly enough the structure we asked for was to bring Billy Ray out of the classroom part of the time to do activities within the school. Our school district would provide a one to one aide to enable him to do these activities but the program didn't feel they could accommodate it. The activities involved were things like greeting the school office staff, doing tasks like putting the chairs in the conferences rooms back after meetings, watering plants, playing basketball, etc. They were not activities that would have cost the program anything other than the one to one aide that would be required anyway. This could be in addition to appropriate (to him) academic skill building. 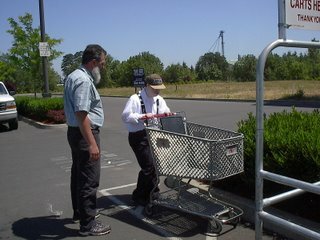 The activities we ended up creating included such things as putting away shopping carts in the Safeway parking lot. I mention this activity because it had several benefits which might not be obvious. It got him out of a sedentary environment, gave him a chance to be active which he requires, gave him the sense of accomplishment and most importantly, it helped to make him a recognized member of the community. 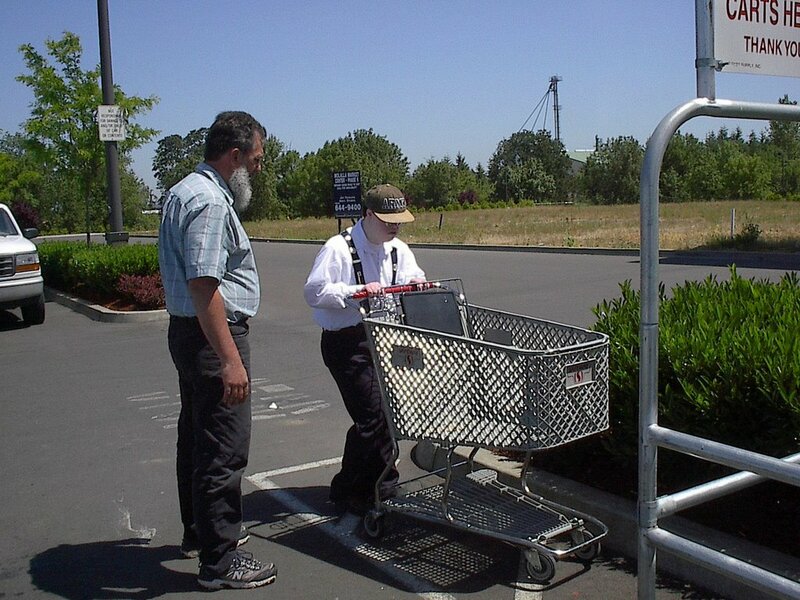 It didn't take long for people who saw him putting away carts for 15-20 minutes three times a week to recognize Billy Ray when they saw him at the local restaurants or supermarket. It was a win-win situation for Billy Ray. Billy Ray has funding for support staff during the week, part of which is from Vocational Rehab. Those funds would normally be used for a vocational program after school eligibility ends (usually 21 years old). Billy Ray would not be able to handle that type of program so he is allowed to use the funds for support staff and adapt activities to his needs. As I am out and about getting use to our relatively new community my mind is always focusing on various businesses, organizations, leisure activities that might be appropriate to him. I have driven past the Humane Society in Bend (27 miles from us) several times. My mind keeps pondering volunteer activities or visiting the animals because he loves animals so much. I like to take him into a new setting to test his reaction to the environment especially noise before I approach anyone about an activity for Billy Ray there. Yesterday was a case in point. We were in Bend for other reasons and had Billy Ray visit the Humane Society and Healing Reins (an organization which has horses as therapy for the disabled). 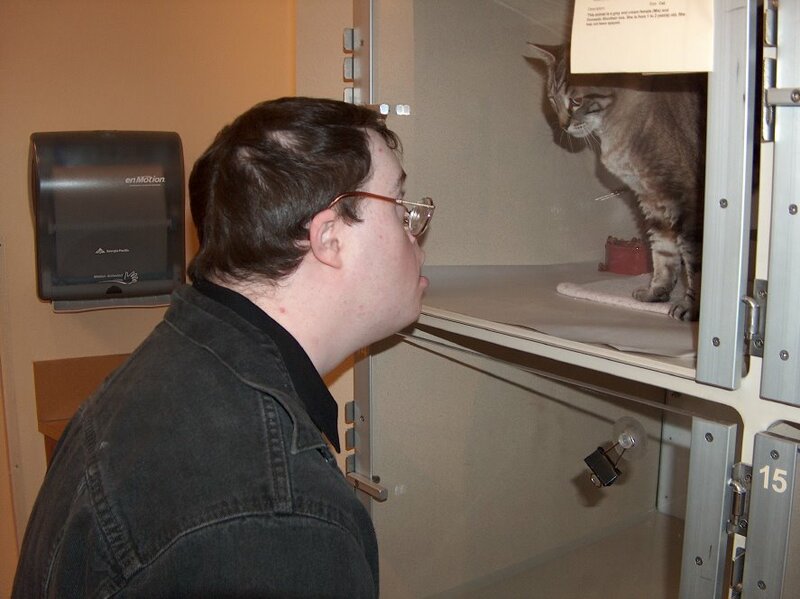 As you can see in the pictures he is especially drawn to the cats and is eye to eye interacting with this one. 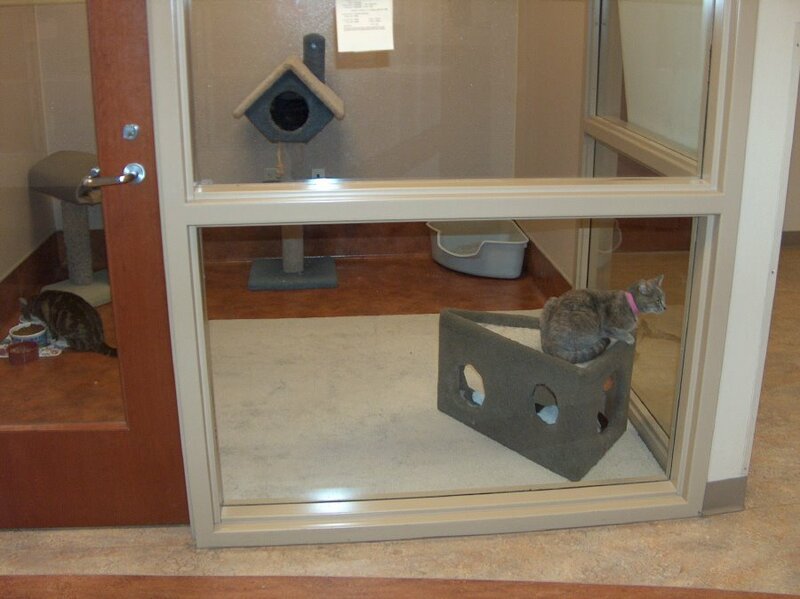 The other picture is a visiting room that the Humane Society. Billy Ray was quite comfortable with the environment at the Humane Society environment. We have ascertained that. The next step will be to contact the Society to determine if there are some volunteer activities Billy Ray and his support staff might be able to participate with. Additionally I will ask whether or not Billy Ray might actually interact with some of the cats in this wonderful visiting room. 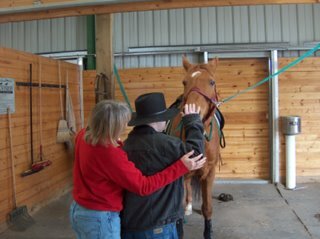 These pictures are of Billy Ray's visit to Healing Reins. 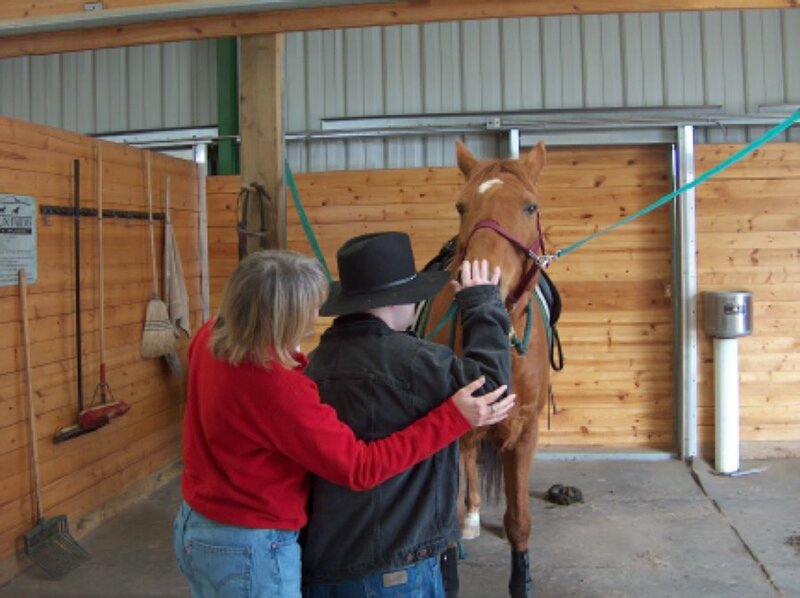 Studies have shown that interactions with horses are great therapy for persons who experience disabilities. Billy Ray loves horses and used to have two of them. Presently he visits a horse named Cloud here in LaPine most weekdays and takes him a carrot. This has become a great experience for Billy Ray and for Cloud who was a little hesitant about visitors in the beginning. He now comes up to the fence to Billy Ray most days. I have previously posted a picture of Billy Ray and Cloud. One thing that we always have to consider in creating a workable schedule and Billy Ray's activities is the absolute need for flexibility. He has only one activity a week that is necessarily firm as to time. That is delivering Meals on Wheels on Wednesdays. Billy Ray loves his interactions with the folks on his route and they him. However, it is an effort to assure that every condition is perfect for him to be willing to participate when he needs to go. The tasks he does on other days have more flexibility. For example, he vaccuums the sanctuary at our little church. If he has a meltdown and needs time to become calm and responsive, sleeps late because he didn't sleep at night, has a doctor's appointment, etc. we can easily rearrange the time. In comparing the two possibilities from yesterday (Humane Society and Healing Reins) there is probably more flexibility to go to the Humane Society whereas Healing Reins are scheduled classes. Another issue that we have to consider is cost factors. If we were able to work out volunteer activities or visits to the Humane Society it will likely cost nothing but the gas to get from LaPine to Bend. There is a cost involved with Healing Reins. In making those decisions you have to also consider which will be more satisfying to the person. There are many ways to benefit both the person and the community (including the school and taxpayers) by being creative in customizing the life experiences provided to a person with disabilities. This is a glimpse in our method of operation presently. The key thing is Adapt and Communicate.